These adorable dolphin and sunburst keychains are handcrafted in a small village in Guatemala. The beadwork is quite intricate which contributes to its visual appeal. Each item is handcrafted; thus, small variations in color and design are part of their unique appeal. The keychains are quite sturdy and measure from about 2 1/2 to 4 inches from the bottom of the keyring. In the drop down menu below, please indicate whether you prefer the dolphin or sunburst keychain. These beautiful hummingbird keychains are handcrafted in a small village in Guatemala. The beadwork is quite intricate which contributes to its visual appeal. Each hummingbird is handcrafted; thus, small variations in color and design are part of their unique appeal. 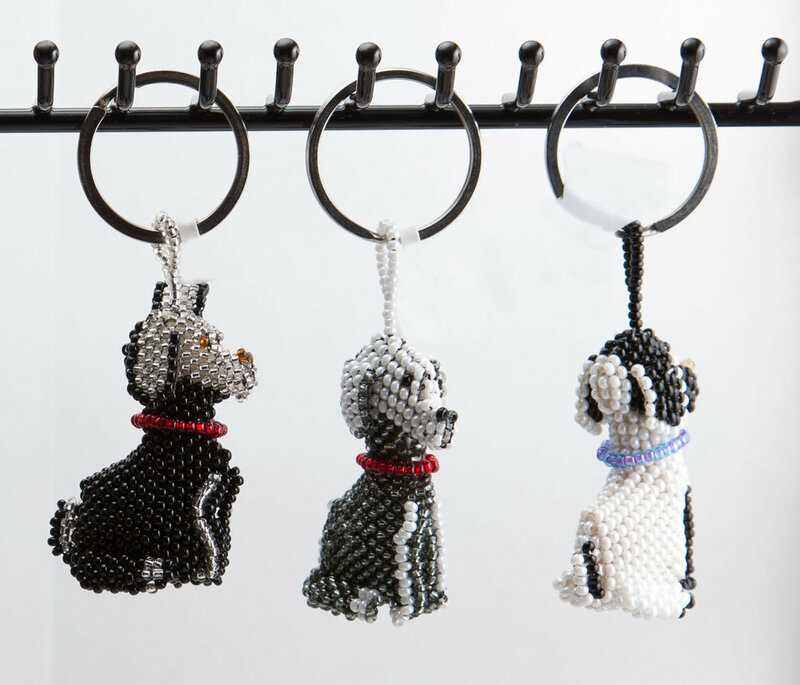 These adorable puppy keychains are handcrafted in a small village in Guatemala. The beadwork is quite intricate which contributes to its visual appeal. Each item is handcrafted; thus, small variations in color and design are part of their unique appeal. Please indicate your preference for a black/gray or white/black puppy keychain in the drop down menu below. These adorable seahorse keychains are handcrafted in a small village in Guatemala. The beadwork is quite intricate which contributes to its visual appeal. The keychains are quite sturdy and measure 2 1/2 to 4 inches from the bottom of the keyring. Each item is handcrafted; thus, small variations in color and design are part of their unique appeal. If you have a preference for a blue or red seahorse, please indicate not your preference in the drop down menu below. We will make every effort to honor your request.